All maps are available in 11" by 17" on water resistant and tearproof paper for $15.00 this includes shipping. They look the same as the big maps only scaled down to fit this paper size. Other sizes are 13X19 for $18.00 and 24X36 for $44.95 on photo or plotter paper. This includes shipping map tube and postage. Download Order Form here and you can use Use PayPal. Atlas Maps coming 18/19 season: Snoqualime and White Pass, Washinghton, Thompson Pass, Alaska, Provo Canyon UT, Vail Pass Colorado. Avalanche Path Atlas Map of Teton Pass, Wyoming. Avalanche Path Atlas Map of John F. Stevens Canyon, Glacier National Park, Montana. Avalanche Path Atlas Map of Cameron Pass, Colorado. Avalanche Path Atlas Map of San Francisco Peaks, Arizona. 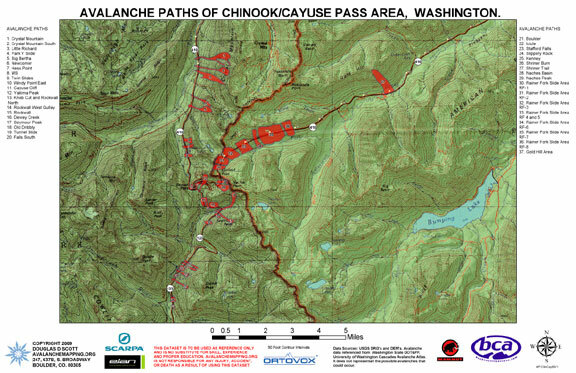 Avalanche Path Atlas Map of Chinook/Cayuse Pass, Washington. Avalanche Path Atlas Map of Stevens Pass, Washington. Avalanche Path Atlas Map of Washington Pass, Washington. Avalanche Path Atlas Map of Lizard Head Pass, Colorado. Avalanche Path Atlas Map of Big Cottonwood Canyon, Utah. Avalanche Path Atlas Map of Wolf Creek Pass, Colorado. Avalanche Path Atlas Map of Turnagain Pass, Alaska. Avalanche Path Atlas Map of Hatcher Pass, Alaska. 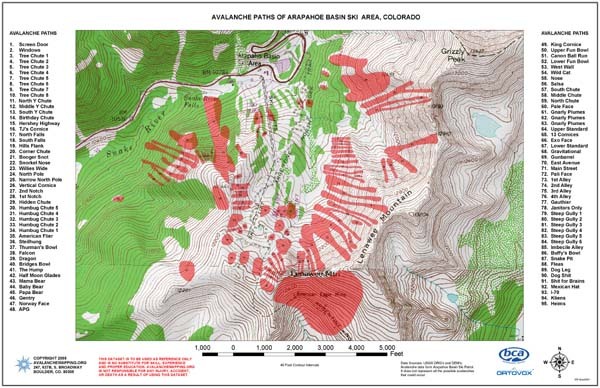 Avalanche Path Atlas Map of Red Mountain Pass, Colorado. Avalanche Path Atlas Map of Arapahoe Basin Ski Area, Colorado on a Topo Map. Avalanche Path Atlas Map of Independence Pass, Colorado. Avalanche Path Atlas Map of Berthoud Pass, Colorado. Avalanche Path Atlas Map of Loveland Pass, Colorado. Avalanche Path Atlas Map of Little Cottonwood Canyon, Utah. Avalanche Path Atlas Map of Arapahoe Basin Ski Area, Colorado. Mountain Chalet, Colorado Springs, Colorado. Boulder Map Gallery, Boulder, Colorado. The Wilderness Exchange Unlimited, Denver, Colorado. Alpenglow Ski And Paddle Sports, Golden, Colorado. Pine Needle Mountaineering, Durango, Colorado. Wilderness Sports, Frisco, Colorado, 970-668-8804. Sawatch Backcountry, Leadville, Colorado, 719-486-2271. DISCLAIMER: THESE MAPS ARE TO BE USED AS REFERENCE ONLY AND IS NO SUBSTITUTE FOR SKILL, EXPERIENCE AND PROPER EDUCATION. SPATIAL ACCURACY OF THIS TYPE OF DATA IS VARIABLE AND SNOW PROFILES CHANGE DAY TO DAY. AVALANCHEMAPPING.ORG IS NOT RESPONSIBLE FOR ANY INJURY, ACCIDENT, OR DEATH AS A RESULT OF USING THIS DATA.